Individuals who have structurally weak teeth may be better suited to treatment with porcelain crowns. Because the Champagne Smiles dentists tailor each porcelain veneers treatment to the individual patient’s needs, they often achieve stunning results that improve the aesthetics and health of their patients’ teeth. The dentists at Champagne Smiles can treat a wide range of cosmetic dental concerns with porcelain veneers, including abnormal spacing, chipping, cracking, crooked teeth and/or discoloration. They listen to porcelain veneers patients’ concerns before devising a unique treatment plan to help them reach their cosmetic goals. Champagne Smiles dentists believe that advanced education, sophisticated dental technologies and personalized care all contribute to great porcelain veneers results. They are dedicated to helping patients achieve beautiful smiles and optimal dental health. Porcelain veneers are strong, durable and highly resistant to stains. They do not require extensive preparation or the removal of tooth enamel, nor do they require very much maintenance after they have been applied. Veneers can last for many years with the proper care. In order to achieve the most natural-looking results, the dentists of Champagne Smiles meet with each patient individually before the placement procedure to thoroughly evaluate the size, shape and health of their teeth. Then, the dentists create a personalized treatment plan that will help patient enhance the natural beauty of their smile. The entire procedure typically requires two visits to be completed. During the first visit, Champagne Smiles dentists create an impression of the patient’s teeth to gain a clear understanding of the structure of their mouth and the characteristics of their teeth. 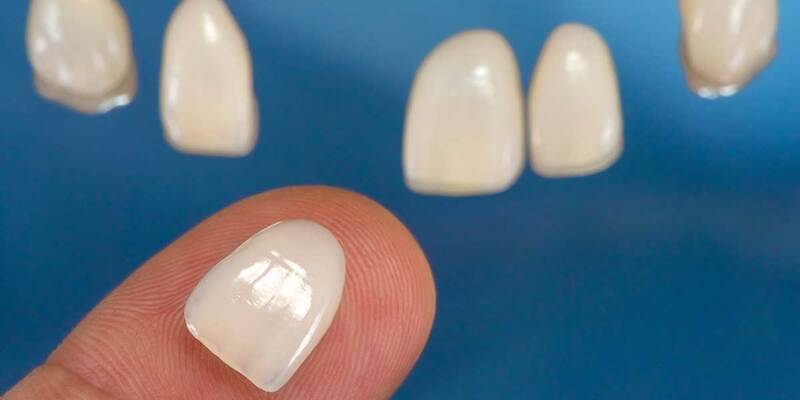 With this information, they create customized porcelain veneers. After the personalized veneers have been created, patients return for application, which is a relatively painless procedure. The porcelain veneers are gently bonded to the fronts of patients’ teeth using a strong adhesive to give patients a dramatic smile makeover within a short period of time. Dr. Champagne and his team offer two of the leading types of porcelain veneers: DaVinci and Lumineers. These advanced porcelain veneers are ultra-thin ceramic shells that are highly resistant to stains and offer long-lasting durability. In addition, because of their small size, these veneers make it possible for patients to avoid the painful shots required with traditional veneers.